The 2012 Honda Civic Sedan has seen a sleeker, lighter, more efficient evolution of the classic sedan, celebrating 40 years of trend-setting design, technology and performance. Boasting keen pricing, great value, cutting edge technology and efficient, lightweight construction among its selling points, Honda has moved the sedan market forward once more! This latest Civic embraces the fundamental concept of a ‘futuristic and distinctive compact sedan’, introducing values ahead of present-day needs that elevate it well ahead of current standards. Major strides have been made in terms of lightweight construction for enhanced fuel economy and performance, as well as more intuitive and involving driving dynamics. Additionally, the new Civic offers markedly higher levels of ride refinement and comfort, interior space and packaging, along with the addition of new interactive technologies for further personalisation and convenience. “The Civic sedan has always offered very competitive pricing, an outstanding overall value proposition and industry-defining quality, together with customer satisfaction and retention,” Eagle states. “With the advent of this latest model, we’re expanding the line-up by introducing a competitively positioned 1,6-litre model that will appeal to younger, family-oriented buyers in this crucial segment. “This is supported by the option of manual and automatic transmissions for every derivative, thus giving the Civic a distinct advantage in the fiercely contested compact sedan category,” Eagle concluded. The eye-catching new Civic represents a fresh interpretation of Honda’s “one-motion” profile, which made its debut on the previous model. For the 2012 model, the emphasis is on a powerful, pure and dynamic body design, with a flowing silhouette that alludes to the car’s premium, high-quality look and feel. The sophisticated appearance is further entrenched by the sleekly angled windscreen, the car’s wide stance, and pronounced character lines that evoke a sense of power and energy. Beyond the smooth and efficient shape, numerous other aerodynamic features are incorporated in the design, including a smooth-bottomed unibody construction to minimise drag and optimise fuel economy. The new Civic’s sleeker aerodynamic profile also benefits overall refinement due to a significant reduction in cabin noise. 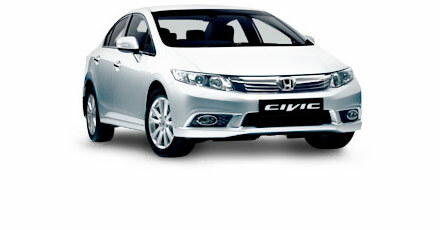 The concept of ‘Smart Technology’ is prevalent throughout the 2012 Civic. It retains the acclaimed and futuristic split-level dashboard, but the layout has been further refined and updated for the 2012 model. A ‘smart interface’ configuration divides the instrument panel into different areas, with key displays located above the steering wheel and secondary information provided in a lower panel. A third area to the left groups the controls which are not essential to driving, such as the intelligent multi-information display for the vehicle and audio information. This innovative system is customisable, and integrates all of the Civic’s multimedia entertainment and connectivity features. Depending on the model, this is complemented by the likes of Bluetooth, auxiliary and USB audio connections, and a fully-featured multi-function steering wheel. On a dynamic level, the smart technology encompasses several new features, including Motion-Adaptive Electronic Power Steering offering variable levels of assistance, along with significantly improved road holding, and reduced fuel consumption. Motion-Adaptive Electronic Power Steering (EPS), combined with Vehicle Stability Assist (VSA), is a passive safety feature that enhances the driver’s control of a vehicle in difficult driving situations. The combined technology assists the driver with oversteer and understeer, as well as slippery road surfaces. Together, EPS and VSA control braking, engine torque and apply assist force on the steering wheel to help maintain control of the vehicle. All models boast Honda’s unique ECON mode, an intelligent fuel-saving assistance system that coaches drivers on the most efficient driving style. Safety-orientated technology, as standard on the range-topping Civic 1.8 Executive, includes latest-generation Vehicle Stability Assist (VSA). The system comprises stability control, traction control and Hill Start Assist. It is also fitted with a tyre deflation warning system. Despite the Civic’s compact dimensions, with reduced overall length (-15 mm) and wheelbase (-30 mm) compared to the outgoing version, improved interior packaging has resulted in notable improvements in space and comfort. Passenger space has increased in all key areas, including an additional 75 mm of shoulder room, and an extra 40 mm rear legroom. The front and rear seats have also been completely redeveloped to offer optimal levels of space, comfort, support and visibility. Similarly, boot capacity has increased dramatically, up from 389 litres to 440 litres on the new Civic, which places it firmly among the class leaders. This is complemented by 60/40 split-folding rear seats for added versatility. Through the greater use of high-strength steel (up from 50 to 55 percent), the Civic’s static and dynamic rigidity have both increased by 10 percent, while overall weight has been reduced by an impressive 7 percent. The Civic employs the latest versions of Honda’s G-Force Control Technology (G-CON) and Advanced Compatibility Engineering (ACE) to provide the highest levels of occupant protection in front, offset, side and rear impacts. Dual front and side airbags are fitted as standard, along with curtain airbags on all but the entry-level derivative. ABS is included on all models, linked to electronic brakeforce distribution (EBD) and emergency brake assist (EBA). The 2012 Civic reinforces Honda’s established reputation for top-class fuel economy and driving performance. The familiar, highly-rated 1,8-litre VTEC engine has been retained, but has been extensively updated to deliver improved performance characteristics and lower fuel consumption. It’s credited with a maximum power output of 104 kW at 6 500 r/min, allied to a torque peak of 174 Nm at 4 300 r/min – the latter in particular offering a more progressive torque curve compared to the previous model. 7 percent compared to the outgoing model, the 1.8 Civic achieves a power-to-weight ratio that is among the best in its segment. This is echoed by the improved combined fuel consumption of 6,7 l/100 km and a CO2 emissions rating of 160 g/km. The expanded model line-up now incorporates a 1,6-litre engine, which employs the familiar two-stage i-VTEC system, programmed fuel injection and drive-by-wire technology. It produces 92 kW at 6 500 r/min, and 151 Nm at 4 300 r/min. All 1.6 and 1.8 models are available with a choice of five-speed manual or automatic transmissions, thus giving the Civic a distinct advantage in this segment. Aside from improved gearshifts, as well as quieter and smoother operation, the latest torque-converter automatic delivers even better consumption and lower emissions than the manual transmission in the case of the 1.8 Civic, with outstanding figures of 6,6 l/100 km in the combined cycle and 157 g/km. Ride quality, handling and dynamics have similarly been fine-tuned to further aid responsiveness, linearity and stability – further cementing the Civic’s fun-to-drive character. The new Civic features a revised McPherson strut suspension set-up in front and a multi-link configuration at the rear. The result is improved handling with less roll, as well as greater comfort with reduced harshness. The expanded Honda Civic range now offers more choice and more features than ever. Even the entry-level 1.6 Comfort provides an outstanding list of equipment that truly sets it apart from its rivals. Included as standard are the likes of 15-inch alloy wheels (with a full-size spare), and electric mirrors and windows all round. A height-adjustable driver’s seat is standard, as is a tilt and reach-adjustable steering column, MP3-compatible single-CD receiver with speed-sensitive volume control, and an auxiliary audio connection. The standard execution also includes manual air-conditioning with dust and pollen filter, an info button on the steering wheel, and speed-sensitive automatic door locks with selective unlocking. The 1.8 Comfort adds heated side mirrors and curtain airbags to this impressive list, while the more luxuriously appointed 1.8 Elegance gains 16-inch alloy wheels, a leather-trimmed steering wheel and seats, as well as hands-free Bluetooth cellphone connectivity, iPod and USB slots, a multi-function steering wheel, cruise control with speed limiter, and automatic climate control. In range-topping 1.8 Executive guise, the Civic additionally benefits from door handles finished in chrome, front fog lights, electric folding mirrors, paddle-shift controls for the automatic version, Vehicle Stability Assist, a tyre deflation warning system, auto headlights and rain-sensing windscreen wipers.